In light of the explosion in consumer demand for all things video and the growing constellation of OTT video services what’s the key piece of feedback that keeps coming back from consumers / viewers? According to research from from Altman Vilandrie & Company – (Annual Survey on Consumer Viewing Habits) it’s that viewers want one single App for all their video and TV watching. This makes complete sense, afterall who wants to have to search through countless different apps to find a movie or tv show that’s worth watching. Viewers want a single app that will allow them to search across all content providers at once. Philo SVOD service to offer channels from US cable giants. Soft launch October. NBCU plans Nordic expansion for its Hayu S-VoD service. Did I mention Apple, they’re about to start spending $1 Billion per year to produce TV shows. For the consumer it means far more choice when it comes to what they watch. Choice between hundreds of TV channels, thousands of movies, millions of hours of trending video. Today with so much choice viewers are crying out for help in finding content that’s relevant, informative and matches their entertainment preferences. Why is Content Discovery so Important? Digitalsmiths’ 2015 Video Trends Report states that “of those who viewers that plan to cut or change video services or switch TV provider, nearly (56%) say they would stay put if their current provider found a way to improve the content discovery process.” In short if service providers can improve their content discovery service, viewers would be able to better appreciate the value of the content they already have. How to Provide an Aggregated Search & Discovery Feature? So content discovery is critical. Quality content is a necessity, but it’s not enough. Programming is destined to fail if audiences don’t know about it or can’t easily access it. With a huge and growing number of choices available, mastering content discovery becomes even more critical. Smarter discovery interfaces should be a key innovation area for service providers. At Vennetics we enable service providers to provide an “advanced search” offering to your customers. Our Mobile Video Platform enables viewers to search and discover all their favourite web based video services all from one place. 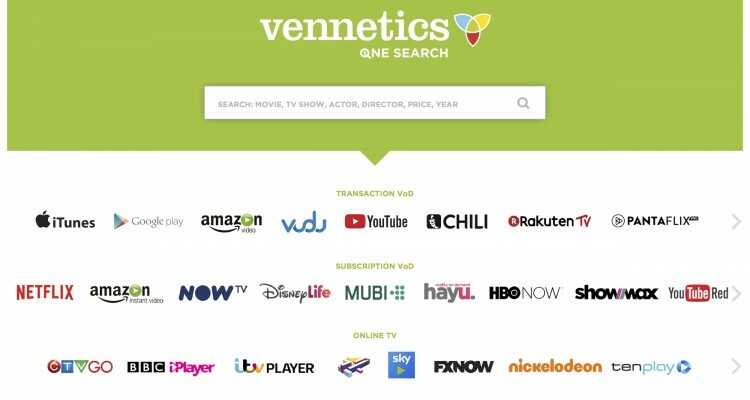 Vennetics Mobile Video Platform is integrated with the leading online video and TV providers and can be easily integrated into an existing entertainment app or launched as a stand alone offering. More consumers are cutting the cord. According to research firm eMarketer in 2017, a total of 22.2 million U.S. adults will have cut the cord on cable, satellite or telco TV service — up 33% from 16.7 million in 2016. “Younger audiences continue to switch to either exclusively watching [over-the-top] video or watching them in combination with free-TV options,” said Chris Bendtsen, senior forecasting analyst at eMarketer. Seeing the writing on this wall, the leading TV programmers such as Disney, NBC Universal, and Time Warner have launched or are prepping direct-to-consumer streaming services themselves. The one thing that can’t be overlooked in this new world of direct-to-consumer streaming services is the need to make it easy for consumers to search and find the content that matches their entertainment needs.